It might be one of the most familiar of the Gospels, but the Gospel of Matthew also feels like one of the least exciting. Mark has a very direct and appealing style. Luke gives us a flowing narrative that is both easy to read and memorable. John’s account is rich in poetry. So how might Matthew’s gospel speak to us? And who does it speak to? In our guest blog today, John Holdsworth imagines what a journalist might learn from Matthew’s gospel. Jo had always wanted to be a journalist, a career which combined her interest in the world at large with a facility for language in a most satisfying way. In her thirtieth year she was on the lowest rung of the journalistic ladder, working with a national daily, and living with Olly. Olly gave every impression of having already exhausted one career. He had been something in the city, which he described as spending long days watching screens, shouting a lot and waving his hands about occasionally. On his thirtieth birthday he had decided there must be more to life than this and had walked out of his job and started to do a degree in theology. Their after dinner (or more precisely, after pizza) conversations often centered on their differing claims to inhabit the real world. Jo’s evidence was the current edition of her paper. She could hardly understand why someone as intelligent as Olly could still live in what she considered to be a cross between a mediaeval world and some fantasy game of dungeons and dragons. Last Tuesday’s slightly wine-fuelled conversation was a case in point. “At one level there were very practical bits of good news that some people needed to hear. In Mathew’s Gospel for example – and let’s stick with him – in chapter 25 he makes the point very strongly that if you are hungry, it is good news that someone is willing to feed you. If you are homeless, it is good news that someone is prepared to find you a bed, if you are without dignity it is good news that there are those who treat you with dignity and provide the practical accompaniments to that. But there are also more sophisticated needs, and even fears, that good news can satisfy. There are people who need to be forgiven, who yearn for reconciliation, who just need a second chance in life, and of course, people who really need to be loved.” “Absolutely,” said Jo. In Everyday Conversations with Matthew, published this month, John Holdsworth imagines the kind of people who might benefit from ‘talking’ to the gospel. What questions could they bring to Matthew’s account? How might a young student be inspired by the sermon on the Mount? How can environmentalists, anxious for the future of the world, connect with Matthew’s concerns about the End? These everyday conversations are predicated on a belief that connections are possible; that there are ways of seeing the pastoral or practical usefulness of the text, and, ultimately that there is some point in reading, preaching and teaching from Matthew’s gospel. Get £2 off the RRP in our pre-publication offer. The theology we encounter in our twenties has a profound effect on our understanding of God, faith and the world for the rest of our lives – and crucial to that process is what we read. To mark Academic Book Week, and a few days ahead of the live final of Theology Slam on 7th March, we asked our judges what book most influenced them in their early adulthood. “My twenties were a time of a lot of theological searching and reading! I was hugely influenced by a mix of writers, but I guess the most important was, without a doubt, Walter Brueggemann. Until I read his Theology of the Old Testament, I had thought the OT boring and off putting. Reading this totally transformed how I read the OT, with the notion of testimony and counter-testimony, helped me look out for story rather than proposition, and gave birth to my own passion for the Old Testament – and got me to read many more Brueggemann books! “I found Phyllis Trible equally fascinating in unlocking some of the most difficult texts of the OT, particularly in relation to gender and gender violence, both in Texts of Terror and in God and the Rhetoric of Sexuality. “I’d always been interested in contemporary literature and films and art but I came to Christ in my last week at Uni and I’d never seen or read anything by a Christian that engaged with any of that material. “I was taught Theology at Durham by the legendary Ann Loades, who introduced me to Simone Weil. “I’m not sure I can remember being in my twenties but I guess it must have happened! The book that most influenced me was probably a little book by Jean Vanier called Brokenness and Community. The book began life as two lectures given by Vanier as part of the Wit Lecture series at Harvard University in 1988. “It is just beautiful in its simplicity. I like to think of the puzzled looks that the good students at Harvard must have shared as Vanier informed them that being clever was not the thing to value, but rather that giving it all up and learning what life is about from those whom society considers to be weak and worthless was the way of the Kingdom. It must have been quite a challenge for them. It was for me. The Live Final of Theology Slam takes place at St John’s Hoxton, London on 7th March at 7pm. Tickets are selling fast, but there are a few still available here. Ahead of the Theology Slam Live Final on 7th March, Ed Thornton of the Church Times caught up with the three finalists. Hannah Barr, 27, is a first-year ordinand and Ph.D. student at Wycliffe Hall, Oxford. Before training for ordination, she worked for an international children’s charity and was a non-resident member of the Community of St Anselm. She has an undergraduate theology degree from the University of Exeter, and an M.Phil. in theology from the University of Oxford. Sara Prats, 23, from Spain, is studying for a Bachelor degree in divinity at the University of London, part-time, and for a Master’s at the University of Birmingham. Her talk will be on “Theology and Mental Health”. She says that the support of Mr Williams has made her feel “much more calm and confident with what I am going to do”, however. Hannah Malcolm, 26, works as project co-ordinator at God and the Big Bang, an organisation that runs workshops for young people on science and religion. She studied theology as an undergraduate at the University of Cambridge, followed by a Master’s degree in World Christianities at Yale Divinity School. Ms Malcolm’s presentation will be on “Theology and the Environment”, although she says that she wants to avoid referring too much to “the environment”, which is “quite a clinical and alienating and scientific-sounding word. It doesn’t trigger any emotional response or sense of attachment. Excerpt from an article first published in the Church Times. Click here for the full article. 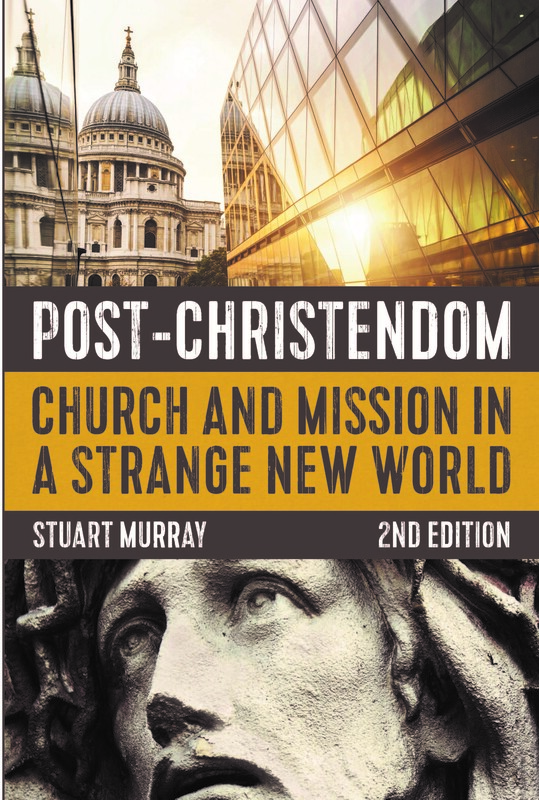 Last year, we published the 2nd edition of Post-Christendom: Church and Mission in a Strange New World. The author is Stuart Murray,Tutor in Mission at Bristol Baptist College. He contributed a guest post to our blog. Europe after Christendom might experience a resurgence of Christian faithas Christians from other parts of the world learn to engage effectively in ‘reverse mission’ and join forces with a chastened and renewed indigenous church. Drawing on recent scholarship on the Pauline tradition within early Christianity, Nicholas Taylor examines Paul’s theology of baptism and highlights its practical application in ministry today. It considers what the rite represented and effected, in the light of the social and cultural milieu in which his letters were written, and of his strategies for mission and the formation and nurture of new Christian communities. The need to integrate recent scholarship with contemporary pastoral issues, and to do so in a theologically reflective way, is acute. Using a wide range of social scientific approaches to the ancient world and Christian origins, including identity, religious conversion, and ritual, the book explores the implications of this reconstruction for contemporary issues of baptismal practice, pastoral care and mission, aiming to bring the insights of specialists to those working on the frontline of pastoral practice. The Apostle Paul is the author of almost half of the New Testament and one of Christianity’s key theologians. In this new and ground-breaking book, E. P. Sanders offers an expansive introduction to the apostle, navigating some of the thorniest issues in scholarship using language accessible to the novice and seasoned scholar alike. As well as giving a detailed study of the life of Paul and an close reading of Paul’s letters he offers profound and wide-ranging insights into the legacy of the man without whom Christianity would not be what it is today. E. P. Sanders has for many years been one of the leading scholars of Paul’s life and work. His book is a key text for scholars and students alike.